Toronto Blue Jays relief pitcher John Axford (77) pitches in the sixth inning against Minnesota Twins at Target Field. But there are appropriate places and ways to do it. For example, if you're going to break up with someone, it's best to do it in private. And if you're going to do it in public, maybe try and keep it as low-key as possible. Well, a couple at Friday night's Phillies game did the exact opposite. 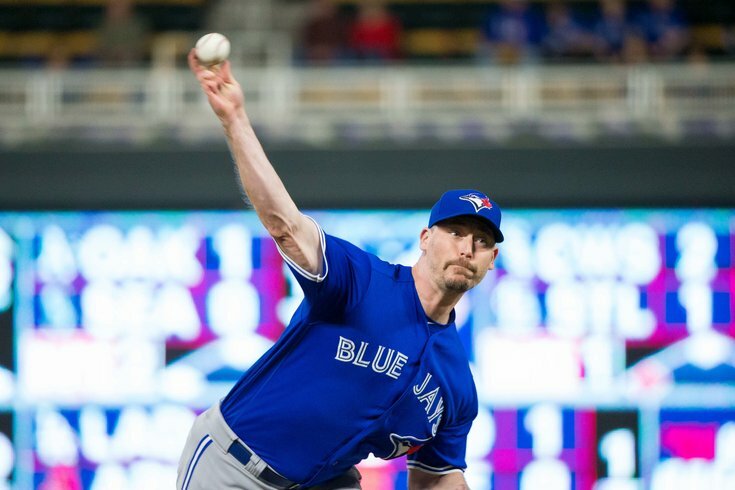 Not only did they do it at a freaking baseball game, but they were so dang loud that Toronto Blue Jays pitcher John Axford could hear them from the visiting team's bullpen. Axford offered to talk them through it during one of the two remaining games in the series. But apparently, they never showed up. We, in the bullpen, assume they’re somewhere between the Bargaining and Depression stages of grieving. We recommend escaping in a good movie alone. Let the tears out. Then surround yourself with friends. Acceptance soon awaits. Axford's tweets are pretty funny. But again, I can not stress enough that, if you're going to end a relationship, a baseball game is not the proper venue to do it. Unless, of course, your significant other proposes to you on the big screen but you're not ready for it. In that case, feel free to end things right then and there.